Article covers who can invite clients to the client portal, how they can invite them, and steps. To invite users to the client portal you must be Organization Administrator within your organization. 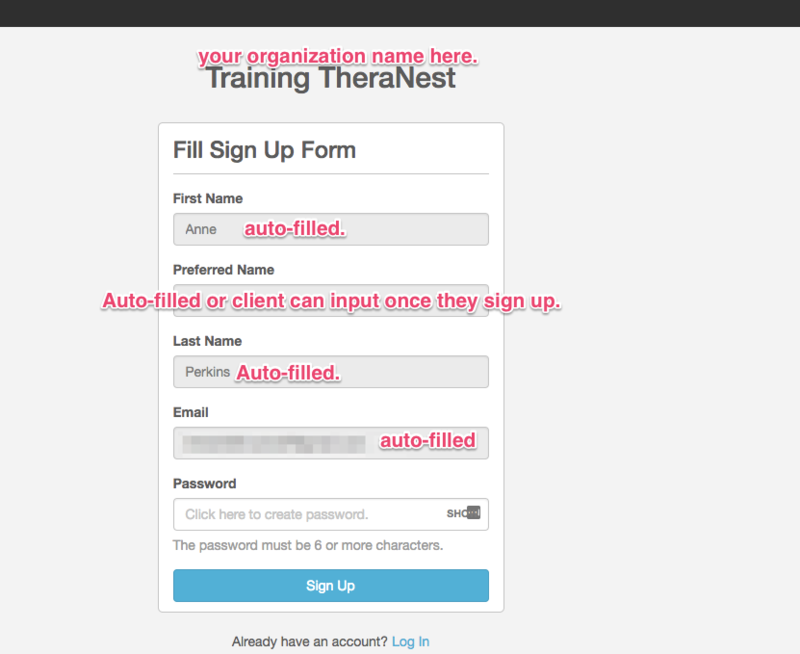 After you have added a client to TheraNest with an email address you may invite that client to the Client Portal. To access the invitation tool, navigate to Organization > Client Portal > Settings. 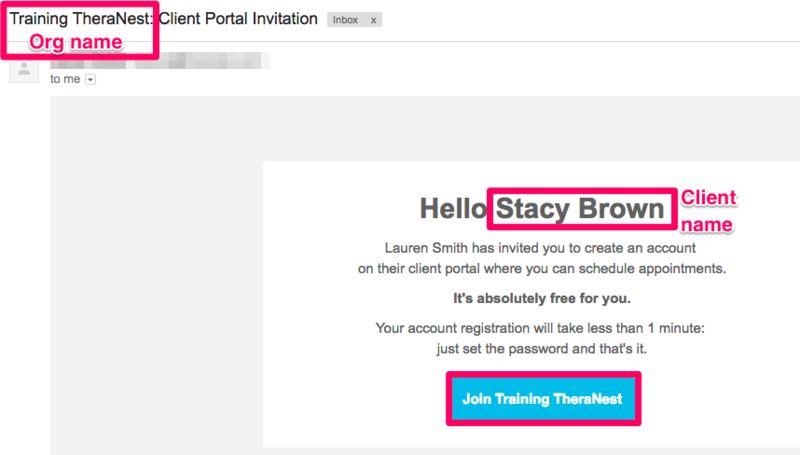 If a client's name is highlighted in green, they have already created a client portal profile and cannot be re-invited; they can simply log in. 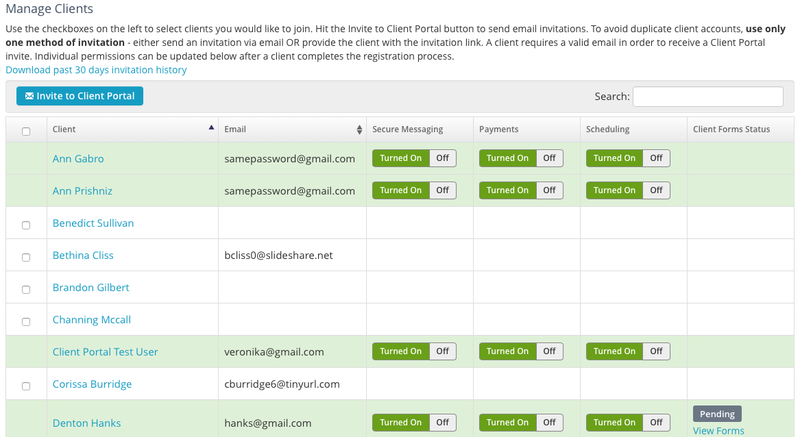 If their name is not highlighted in green, they do not yet have a client portal account and can be invited. Note: Client portal accounts are associated with clients and not necessarily email addresses. If a client has a new email address please update that client's email address on their profile. They can then use that new email address to login to their existing client portal account. Search for the client's *name in the Search field or find clients' names in the list. *note the client's legal name will appear here and not the preferred name. Use the checkboxes on the left to select clients you would like to join. Click the Invite to Client Portal button to send email invitations. To avoid duplicate client accounts, use only one method of invitation -- either send an invitation via email or provide the client with the invitation link. A client requires a valid email address to receive a Client Portal invite. Individual permissions can be updated after a client completes the registration process. You can select/invite multiple clients at a time. Review the invite message that will be sent to clients. You can add and remove any text from the message as well as use the placeholders to populate information in your message. You can even mark the box to save it for later use. *Note if you use the placeholder for client preferred name your client's preferred name will populate. If you have clients who do not have a preferred name, their first name will populate. You do not need to add both placeholders. On the right you'll see the available intake forms to submit to your clients. Be sure to select the intake forms that are applicable to the clients you are inviting. The intake forms selected will be applied to all selected clients you’re inviting to the portal. Once your message has been crafted and intake forms selected: Click Preview Invitation to review the invite message as it will appear to the clients and the selected intake forms. 3) Was the Invite sent successfully? To check if the invitation was sent successfully you can download the past 30 days invitation history from TheraNest. This is located in the invite tool above the "invite clients to portal button." It will download into a CSV document containing the client's name, email address, status, sent by, sent on, the message, and the intake forms that were selected. Again, clients who have successfully created a client portal account will appear in green in the Manage Clients section. If a client you invited to the portal is not showing in green you can always invite them again. For clients who did create a client portal account, you can manage their individual settings such as the ability to schedule appointments or send secure messages. You can also see if they have successfully submitted their intake forms. Intake forms that were submitted successfully will be uploaded to the client's General Documents tab on their profile. Clicking View Forms in the Client Forms Status column will bring you to the client’s General Documents tab. The Shared Forms section at the bottom of this tab is where you can track the status of forms sent, resend and revoke forms, as well as share new forms not previously sent. All clients will need to do is select a password once the Join button from the invite is clicked. Access to our Client Portal for one staff member is included with your subscription, then $6/month per additional therapist who need to receive appointment requests and or secure messages from the portal. Clients can update their demographic and billing info, complete intake forms online, and make payments online via our integrated credit card processing. Additionally, you can enable self-scheduling and secure messaging for your clients. Click here to subscribe additional staff members to the client portal.